Several factors may be involved in causing a horse to become malnourished or in debilitated condition. While age and concurrent disease can play a role, the most common reasons for severely malnourished horses are owner ignorance and economic hardship. The problem of the neglected horse has worsened in recent years due to the global recession and almost simultaneous closure of equine slaughter facilities in the US. Prior to closure in 2007, these plants processed approximately 68,000 horses per year. Approximately 100,000 horses per year in the US are categorized as “unwanted,” and a relatively small amount of these horses make it into a rescue or sanctuary where they can be rehabilitated and rehomed (For more information on the Unwanted Horse and how you can help, please visit the Unwanted Horse Coalition @ http://www.unwantedhorsecoalition.org/). Some of the horses that are sent to these facilities are in poor body condition and can even be considered emaciated. The first step to rehabilitating a starved horse is to have a veterinarian assess its overall health. A weight and body condition score (http://www.badgervet.com/blog/2013/body-condition-scoring) will be taken at this time. Scores between 4 to 6 are considered optimal, while scores below 3.5 are considered thin to emaciated. In horses with very poor to emaciated body condition, the backbone, ribs, and hip bones are prominent, with their head appearing to be disproportionately large for its body. They may have a poor haircoat, depressed attitude, dull eyes, and lethargy with a lack of interaction with other horses. A physical exam and other diagnostics will be performed in order to determine if there are any medical reasons for the severe weight loss. Poor dental health can cause a horse to be unable to chew and process food adequately. Lameness issues can make it difficult for horses to get to their food or maintain a high enough herd position to get enough nutrition. Other conditions such as PPID, carrying a high parasite load, or problems with the other body systems can also contribute to starvation. If any underlying medical issues are uncovered, they can be addressed during the refeeding process. In a normal horse, fats and carbohydrates are used for energy that powers all exercise and body functions. These fats and carbs are replenished constantly as a horse eats a normal diet. In starvation, these carbohydrates and fat stores are used up as the body is not replenishing them adequately. If the starvation process is not interrupted at this point, the horse’s body will begin breaking down protein as an energy source. As a starving body cannot choose what protein stores it will break down for energy, it will use not only the skeletal muscle, but also from vital organ systems such as the heart and gastrointestinal tract. When a horse loses more than 50% of its body weight, the prognosis for survival is very poor. While one’s instinct would be to throw heaps of food at the starving horse, a slow, steady approach should be taken when introducing food. Refeeding too much, too soon, can overwhelm the digestive and metabolic system and can end up killing the horse. “Refeeding Syndrome” is caused by feeding concentrated calories, which causes a rise in insulin. The insulin spike moves carbohydrates into the cells for future use, but also causes magnesium, calcium, potassium, and phosphorus to move into the cells as well. No longer having enough of these electrolytes in circulation can cause kidney failure, respiratory failure, cardiac collapse, and death. Hypokalemia (low potassium in the blood) causes muscle weakness, neurologic dysfunction, poor heart muscle function, seizures, and coma. Hypomagnesemia (low magnesium in the blood) can cause the horse to become nervous, irritable, or aggressive. Hypophosphatemia (low phosphorus in the blood) causes hemolytic anemia (destroys red blood cells). Hypocalcemia (low calcium in the blood) will cause ataxia (unsteadiness), seizures, hyperexcitability, high heart rate and respiratory rate, muscle fasiculations, and ileus (lack of movement of the intestines). Experiments have been conducted in order to find the best diet for refeeding malnourished horses. The first at UC Davis consisted of testing three very different types feed due to their difference in nutrient composition. Alfalfa hay, which is very high in protein but low in carbohydrate starch; Oat hay, which is high in fiber but low in protein; and a commercially available complete feed that consisted of grains, molasses, fat, and alfalfa – this feed was high in carbohydrate starch. The three feeds were given to 22 starved horses, and they were fed one of the three diets over a 10 day rehabilitation period. The amounts fed were similar in caloric content so that the horses fed oat hay were given the largest volume of feed, and the horses on the complete feed were given the smallest volume. The horses fed the high-carbohydrate diet had insulin released due to the high level of starch. As previously discussed, this caused carbohydrates to be pulled into the cells, as well other electrolytes. This depletion of electrolytes from the bloodstream caused kidney, heart, and respiratory failure within 3 to 7 days after initiating the diet due to the continued insulin spikes and subsequent depletion of circulating electrolytes. The oat hay diet was very bulky and induced diarrhea in several horses. The oat hay was also low in several necessary nutrients such as phosphorus and magnesium, and deemed inadequate for successful rehabilitation. The alfalfa hay diet had the best results due to its high level of protein, phosphorus, and magnesium. Alfalfa is also low in carbohydrates, so the effects of insulin release were minimal. Another study conducted by UC Davis compared straight alfalfa hay to alfalfa hay and corn oil, to increase the energy density of the meal. Both diets again were fed on an equal calorie basis. In this study, the corn oil had no detrimental effects, but served to decrease the total nutrient content of phosphorus and magnesium content in the diet. This caused a decreasing blood phosphorus level during the 10 day period, which was not beneficial to rehabilitation. Straight alfalfa again was show to be the most effective feed to deliver the necessary nutrients in appropriate amounts to the malnourished horse. Days 1 to 3: Feed one pound (approximately 1/6 of a flake) of high quality, leafy alfalfa every four hours (total of 6 lb per day in 6 feedings). Have a veterinarian evaluate the horse’s medical status. Days 4 to 10: Slowly increase the amount of alfalfa and decrease the number of feeding so that, by Day 6, you are feeding just of 4 lb of hay every 8 hours (total of 13 lb per day in 3 feedings). Day 10 to several months: Feed as much alfalfa as the horse will eat and decrease the feeding to twice a day. Provide access to a salt block. Do not feed grain or any supplemental material until the horse is well along in its recovery – early feeding of grain/supplemental material can complicate the return to normal metabolic function and result in death. **Provide clean, fresh water at all times. UC Davis’s research has found that the best approach for initial refeeding consists of frequent, small amounts of high-quality alfalfa. High quality alfalfa is very leafy, with fine stems, no dust or mold, and has a crude protein content of 16 to more than 20%. For horses with dental issues that do not allow it to eat hay, soaked alfalfa cubes or pellets can be substituted. The amount should be slowly increased at each meal, while the number of feedings should be decreased gradually over a 10 day period. After this, the horse can be fed as much as they will eat. After about two weeks, the horse should show increased energy levels. While some weight can will occur after a month, three to five months or more may be needed to completely rehabilitate a malnourished horse to a normal body weight. Caretakers are urged to continue to seek veterinary advice and nutritional consultation during the process, and to be patient and move slowly, as feeding too aggressively too early will worsen the horse’s prognosis for recovery. Grain supplementation can be implemented very slowly and gradually after a few months of the alfalfa diet – refer to your veterinarian for more specific instructions based on the individual horse’s progress. A successful rehabilitation – before and after. 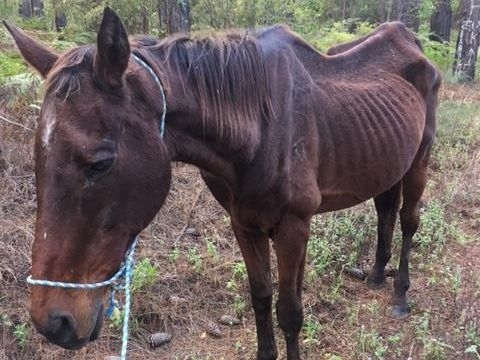 Keep in mind, the odds are never in the horse’s favor when dealing with a starving animal. Even with proper refeeding technique, about 20% of severely malnourished horses will die. The costs of rehabilitating a starved horse are very high, including shelter, feeding, medication, and anti-parasitics. If successful, however, rehabilitating a neglected horse can be a very rewarding experience. 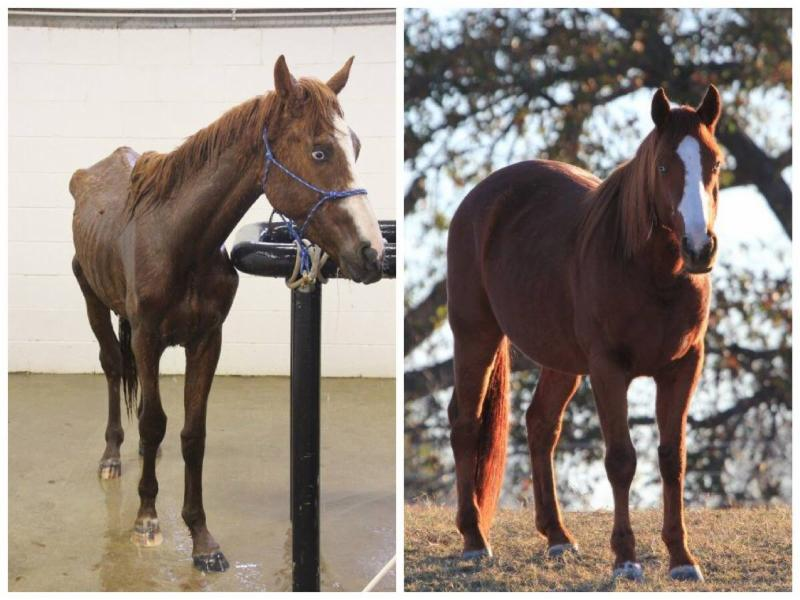 A neglected horse requires more than food and water to become completely rehabilitated. Proper hoof care is necessary to keep the horse able to move around normally. Extremely overgrown hooves should be trimmed immediately, and the horse then worked into a regular farrier schedule. Grooming, along with proper nutrition, will allow the horse’s to grow a normal, healthy haircoat. Avoid forced exercise until the body condition score is at least a 3.5. Start with light lunging for 5 to 10 minutes, or hand walk them once to three times a week. This will help the horses start to build muscle, as they are increasing their nutrient reserves. 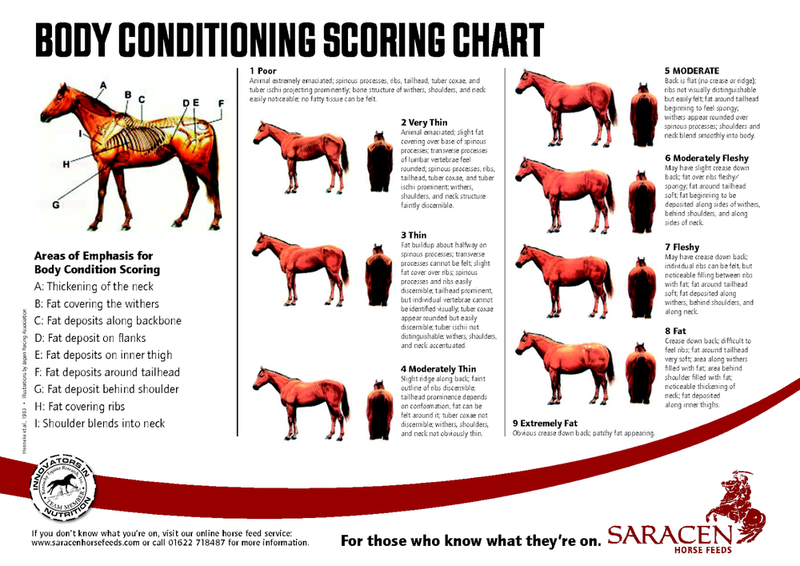 Adequate TLC, along with proper nutrition, can pay off in with these horses in many ways.